Two years ago, I wrote this post about having a list of activities to which a parent could refer a bored child. It’s that time of year again, and I have revised the list slightly and revamped it visually. 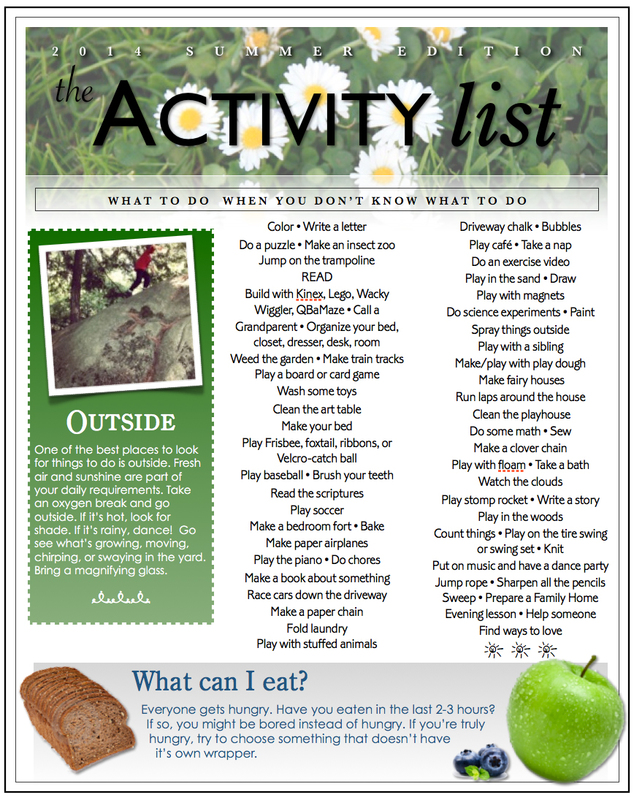 You can find it in 8.5×11 pdf form here: Summer Activity List 2014. Use it as-is or use it as a springboard for your own list. My children made most of the suggestions (yes, including the one about doing chores), and yours might have even better ideas. Summer is hard for me. I dread the chaos and disorder and heat and whining kids of summer, so my best defense is a good offense. We make the list of spur-of-the-moment activity ideas ahead of time. This year we even made an extra summer chore chart with Wednesday AND Saturday chores so that I am not the main source of all cleanliness and order, because, frankly, I cannot keep up. I really do love September…. May your summer, however long or short it might be on the calendar, be full of the comfort and fun of regular, scheduled family activities. And may the quiet, unplanned moments of wonder, discovery, and peaceful joy slip softly between the obligations to create a beautiful, memorable season. This entry was posted in Family Life, Life, Parenthood, Summer and tagged acitivities for kids, creativity, family, fun, life, mom, outdoors, summer, summer fun by Maren. Bookmark the permalink. Our summer break doesn’t start for another month, but we have been talking about ways to change the few things that we didn’t like about last years breaks. Chores are one of them. With everyone home the house seems to always be filthy! We have a similar list as yours too, so I am going to compare and revise ours with some of the great ideas you guys captured and we didn’t! Great! Please post some of your family-specific ideas here, too. Have a great summer! That’s wonderful. Thanks for the ideas!